"Round and round and round she goes, where she stops nobody knows!" We all remember hearing that from old carnival times, maybe even from today�s midway events. The "she" the quote refers to is what the casinos now call the Big Six Wheel or Wheel of Fortune. 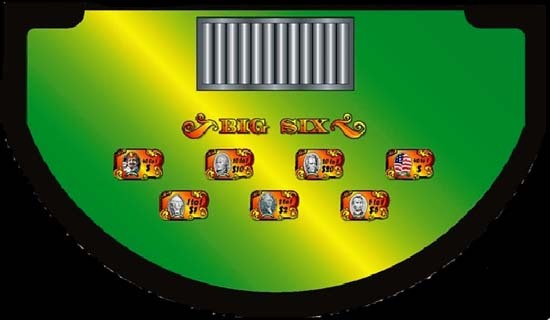 The Big Six got its name because there are six different bets a player can make. That�s it! It�s an easy game to play with very little strategy involved. This is truly a game where "luck," if you have it (and if you believe in it), plays an important role. In almost every larger casino, usually as soon as you walk in, you will see a large vertical wheel spinning, and players standing or seated at a table in front of it. This is usually the only Big Six game in the house. The wheel consists of 54 equal sections, with a metal or wooden peg separating each one. A rubber flapper sits on top at the 12 o'clock position and is stationary. Each section of the wheel is marked with the United States currency of the denominations $1.00, $2.00, $5.00, $10.00, $20.00. Two of the sections are marked by a Joker and/or the casino logo, with the number 40 accompanying them. Players place their bets directly on the table on top of the number or currency symbol that corresponds to the numbers on the wheel as the wheel is spinning. You can continue to wager until the dealer announces "No more bets." Winning bets are determined by whichever number or symbol section the flapper stops in. The dealer then takes off all losing bets and pays all winning ones and the game begins anew. The amount of the payoff for this game varies depending on the currency or symbol the flapper stops at. Below is a list of the payoffs. Players may make as many bets as they want per spin. Just remember that only one of the symbols is going to hit, and since there are 23 $1.00 sections out of a total of 54 sections, your chance of hitting that number is far greater than hitting one of the two 40- to-1 sections.